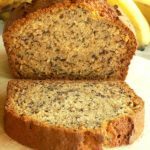 You’ll love this deliciously moist and soft simple banana bread recipe that takes only 10 minutes to prepare! 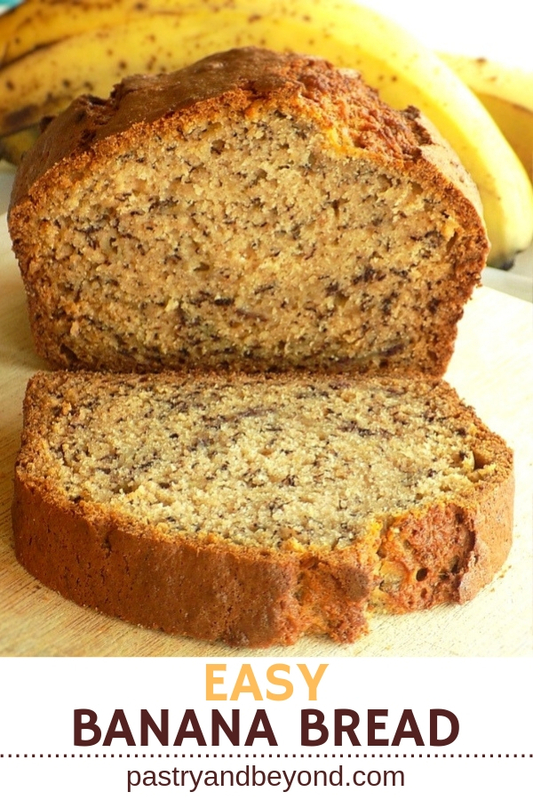 Today I am sharing my easy and yummy moist banana bread. When there are ripe bananas, usually smoothies and banana bread come first into my mind. 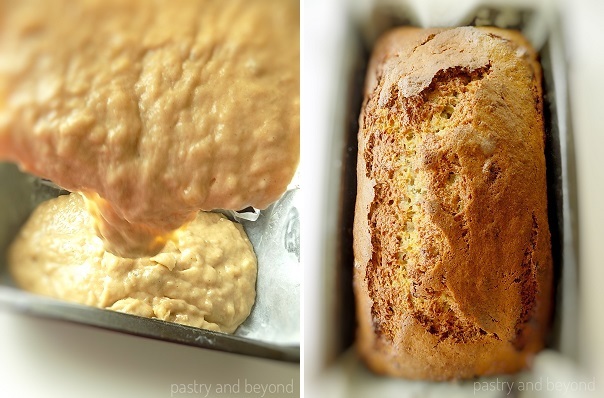 But what if you don’t have ripe bananas and you want to eat this delicious banana bread? The answer is simple: ripen the bananas! If I forget bananas in their bags, they ripen very fast almost in 12 hours or even shorter, depending on how ripe they are. If you need them in 15-30 minutes, you can ripen bananas quickly in the oven at 300°F(150C°) by placing them with their peels. This method is not recommended for very green bananas. You can check the link! You may find other options as well. 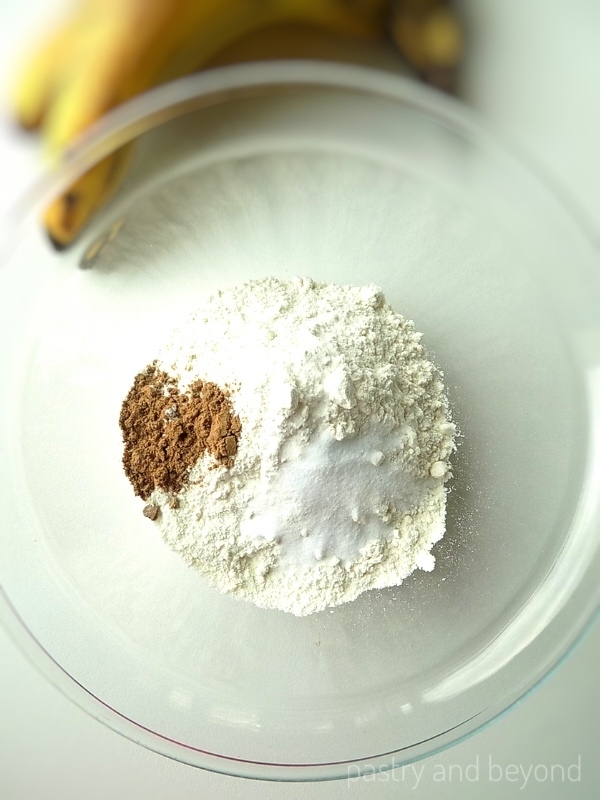 Granulated Sugar-this banana bread is moist enough with white granulated sugar but if you like you can use brown sugar for extra moisture and flavor. 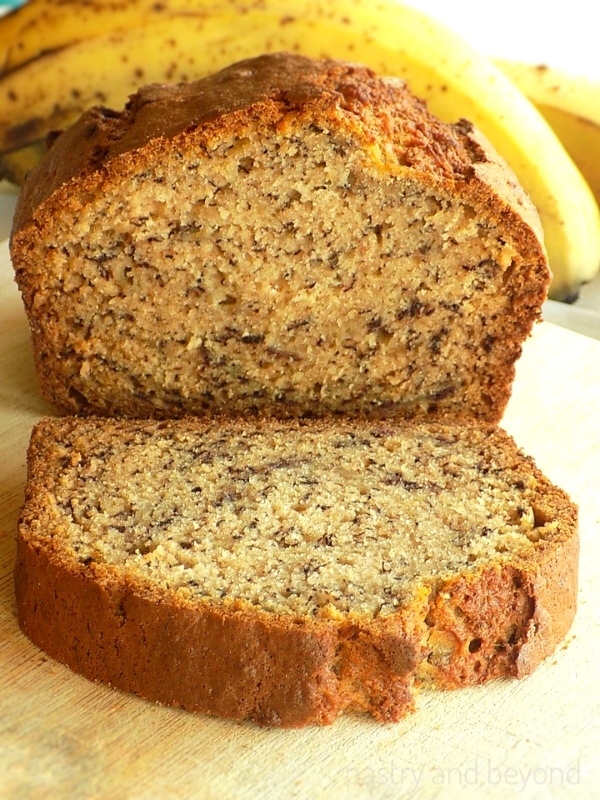 If you like you can add chocolate chips or walnuts that go very well with this banana bread. After the banana bread is completely cooled, cover well with a plastic film. It stays fresh up to 2-3 days at room temperature and up to a week in the fridge. If you want to freeze, you can cover the banana bread well with a plastic film first and then with aluminum foil. Instead of aluminum foil, you can place it in a freezer bag-taking all the air inside. I suggest you slice the banana bread before or any bread especially if you freeze them as they will thaw quickly when you want to eat them. First, mix the flour, cinnamon and baking soda in a medium bowl, set aside. Then place the bananas in a large bowl and mash with your fork. If you slice the bananas, it makes it easier to mash. Next add the melted butter, milk, sugar and mix with a whisk or a spoon/spatula. Mix in the egg and then add the vanilla. Finally, add the flour and mix until just incorporated. Place the mixture into the pan and bake for 40-45 minutes or until a toothpick comes out clean that is inserted in the center. Let it completely cool before slicing with a serrated knife. Enjoy! 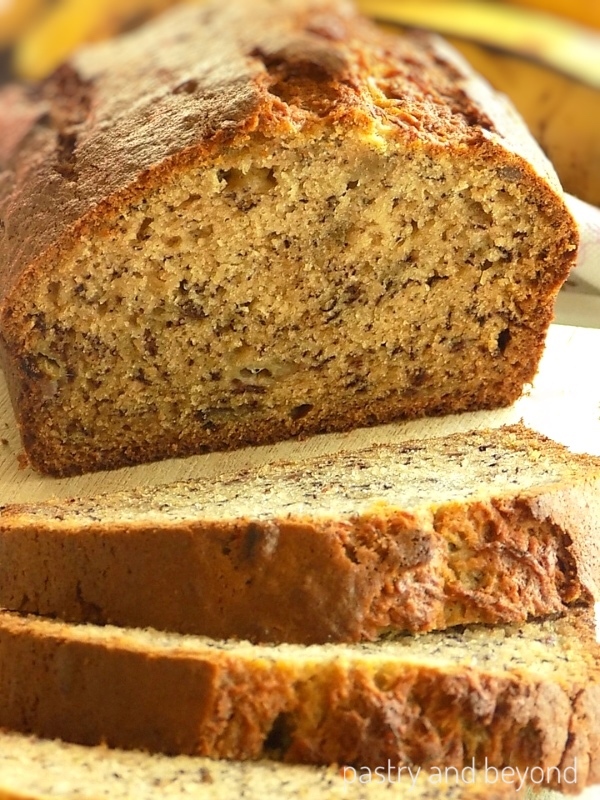 This simple banana bread recipe is deliciously moist and soft. 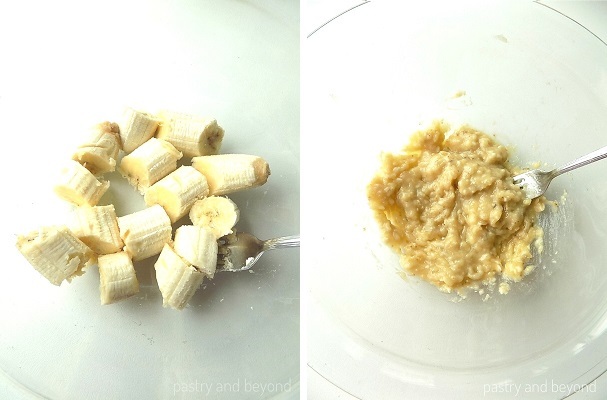 You'll love this easy & yummy banana bread that takes only 10 minutes to prepare! Preheat the oven to 350°F(177C°). Grease 8 1/2 * 4 1/2 inch (21,5*10,5cm) loaf pan and line the bottom and sides with parchment paper, about 2 inches(5 cm) of overhang on each side. If you like, you can grease and flour the dish instead of parchment paper. 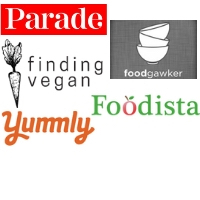 Mix the flour, cinnamon, baking soda and salt(if you are using) in a medium bowl, set aside. Place the bananas in a large bowl and mash with a fork. If you slice the bananas, you can easily mash the bananas. Add the melted butter, milk, sugar and mix with a whisk or a spoon/spatula. 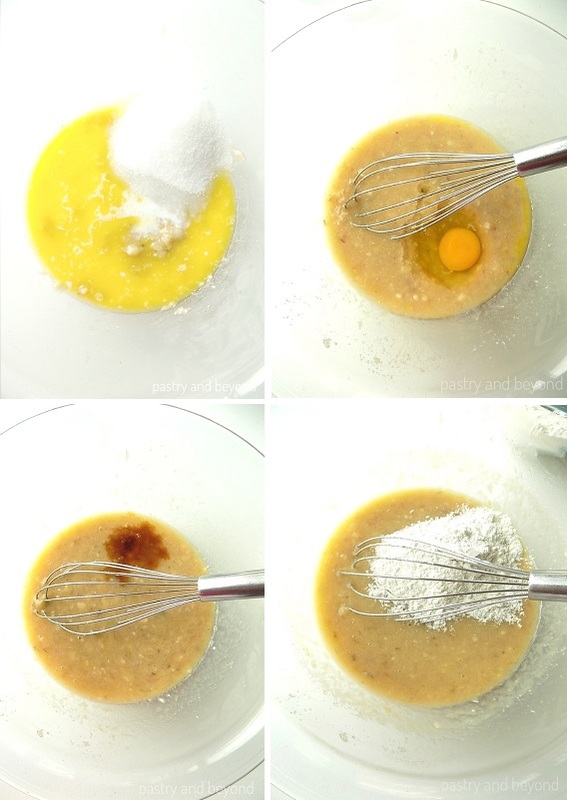 Mix in the egg and add the vanilla and mix. Finally add the flour and mix until incorporated. Place the mixture into the pan and bake for 40-45 minutes or until a toothpick comes out clean that is inserted in the center. Let it cool in the pan for 10 minutes and then let it cool completely on a wire rack. Slice when it completely cools. Well wrapped banana bread stays fresh up to 2-3 days at room temperature and up to a week in the fridge.